As the national Pay Commission has finalised its recommendations, there is resentment among employees against the Punjab government for not finalising the terms of reference of the state Pay Commission which was constituted a few months ago. “Either the state government should fix the terms of reference of the commission or it should enhance the retirement age to 60,” said Oma Kant Tiwari, general secretary of the Punjab Non-Gazzetted and Gazzetted Employees Organisation. Without naming Simranjit Singh Mann, a group of SAD (A) workers today announced his removal from the post of the president. The party formally split into two when Daljit Singh Bittu, a senior leader, announced dissolution of the existing structure and announced a new presidium here. He was addressing party workers. Expressing concern over the installation of the portrait of Sant Jarnail Singh Bhindranwale, Punjab BJP in charge Balbir Punj has asked the SGPC to give it a second thought. Taking cognisance of the number of complaints of police excesses pending with the Human Rights Commission and other criminal cases registered with the police going northward as reported in the press, former Punjab Minister and spokesperson of the Punjab Pradesh Congress Committee, Jagmohan Singh Kang, today expressing great concern, urged Punjab Chief Minister Parkash Singh Badal to gear up the administration and ensure law and order in the state at any cost in larger public interest. The withdrawal of security cover of president of the Shiv Sena (Hindustan) Pawan Kumar after he had opposed the installing of the portrait of Sant Jarnail Singh Bhindranwale at the Sikh Museum has led to a fresh controversy. Congress workers today took out a procession in the town against the harassment of party's activists at the hands of the police. Led by MLA Kaka Randeep Singh, the workers organised a protest rally against the implication of their party colleagues in false cases. 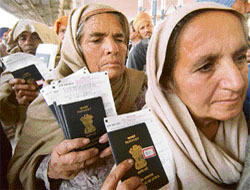 Questioning the rationale that could justify the grant of red beacons and security cover for members of the SGPC, president of the Shiromani Akali Dal (Amritsar) Simranjit Singh Mann stated that the move could provoke religious leaders of different sects to demand the same privileges for themselves. 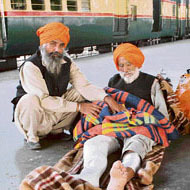 A pall of gloom descended at the Attari railway station here today when the fourth special train from Pakistan brought two bodies of women devotees who had gone on pilgrimage to Sikh shrines there to mark the birth anniversary of Guru Nanak Dev. The Punjab government has sought a report from the Punjab State Electricity Board (PSEB) with regard to the recruitment of sub-divisional engineers. Sources said that the PSEB authorities had been asked to submit a detailed report on the process followed with regard to the recruitment. The Law and Justice Committee, Government of India, will take up the Anand Marriage Act in its forthcoming meeting to be held in New Delhi on December 4. The sprawling complex of the sacred Takht Damdama Sahib here is being given a facelift by demolishing some old structures and constructing a park in the front. 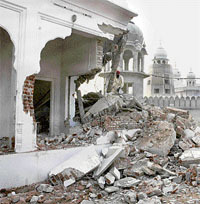 Gurdwara Baba Bir Singh Dhir Singh is being relocated for constructing a wide circular path around the main gurdwara where Guru Gobind Singh compiled the final edition of the Guru Granth Sahib. A doctor on duty in the Emergency Department allegedly has molested a patient on the pretext of examining her. Chief Minister Parkash Singh Badal today expressed grief over the demise of BJP leader and former member of Parliament Lajpat Rai, who died this morning at Ludhiana after a prolonged illness. Taking up a petition filed by 10 current-duty-charge inspectors with the Ludhiana Municipal Corporation alleging out of turn promotion of another inspector, a Division Bench of the Punjab and Haryana High Court yesterday asked the principal secretary, Department of Local Bodies, to remain present in the court. Five more senior teachers of Punjabi University, Patiala, holding additional charges of various offices, today submitted their resignations following the resignation of vice-chancellor Swarn Singh Boparai a few days ago. The Punjab government today proposed to levy 4 per cent VAT on fruits and vegetables products. The decision will come into force immediately. The items on which VAT would be levied include jams, pickles, jelly and fruit drinks, tinned as well as open.